Paris Nelson doesn’t take being a first-generation college student lightly. From the very beginning, she has done everything possible to get her hands in every aspect of the college experience, cherishing the opportunities she made for herself along the way. Nelson grew up with her father in Haleyville, Alabama, where the two made ends meet on their own. Her brother had passed away, and her mother was no longer in the picture. Under these trying circumstances, her father instilled in her the importance of a college degree. Nelson thought of higher education as the way out of her rural hometown and into a world of options, so she worked hard to help her father make ends meet, working two jobs while trying to graduate from high school with everyone else. She applied for the Smith Scholarship during her senior year of high school, a scholarship program based out of Birmingham that receives approximately1,500 applications each year. She has been active in undergraduate research, focusing her efforts on illuminating the problems that face other first-generation students like her. She won first place in overall research at the 2016 McNair Scholars Day and first place at Undergraduate Research Day 2017. She also presented her research at this year’s National Communication Association annual conference in Dallas. Her paper was one of nine accepted in the nation. These achievements have unlocked opportunities for her to travel throughout the United States to present her research. 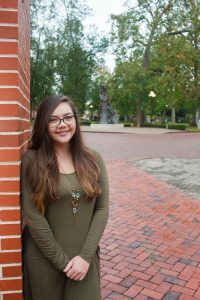 Nelson cited her research methods, interpersonal communication and intercultural communication classes as particularly impactful to her development as a communication studies major and a professional in the field. All of this passion and involvement led to her internship with Italian marketing firm Ellesse Edu this past summer in Rome, Italy. There she was able to exercise everything the University of Montevallo had given her over the years. At Ellesse Edu, Nelson was charged with designing a STEM program for the Italian school system, specifically targeting middle school aged students to encourage them to go into scientific fields. She created and pitched her ideas to the aircraft manufacturing company, Boeing, for funding and they loved it. Now, her program is being implemented into schools, and she has the opportunity to see something she created benefit children across the globe. Nelson received a job offer from Ellesse Edu, and hopes to move back to Rome very soon to see her STEM program through. She plans to return to the U.S. next fall for graduate school.